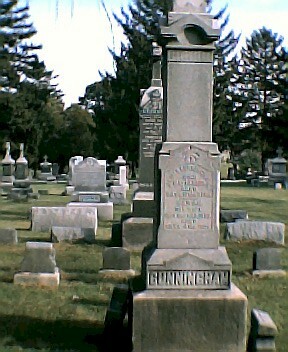 James Cunningham was born 6/24/1822 in County Sligo, Ireland. In about 1846, he married Sarah O'Connor b. 5/4/1824 in County Sligo, Ireland. James, his wife Sarah, and brother Jeremiah were some of the survivors of the Great Famine which was especially pernicious in the later famine era in Western Ireland. James and Sarah immigrated 2/26/1847 to New York aboard the Ashburton. James and family initially settled in New Jersey where the first four children were born. James and Sarah migrated in 1855 to Davenport IA where they settled down and raised their family. In the 1856 Iowa Census, James is listed as a laborer. However by 1863, James is found in the city directory listed as a contractor. Due to their upward socio-economic mobility, the family moved, literally, up the hill to a prosperous neighborhood from which James was elected to the City Council. 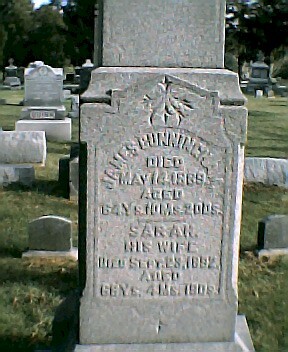 James died 5/14/1889, and Sarah died 9/23/1892. Both are buried in Mt. Cavalry Cemetery, Davenport IA. 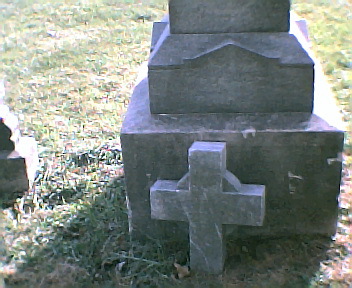 At the base of the Cunningham/Quinn Family Monument is found a Celtic Cross which was the original capital of the monument. Passenger List for Packetship "Ashburton"
Sarah     36   F   W           "
James G.   9   M   W           "
Mary A. 7   F   W           "
Sarah      6   F   W           "
Margaret   3   F   W           "
Bridget    1   F   W           "
Sarah      46   F   W            "
James      19   M   W  Teamster  "
Mary       17   F   W  At Home   "
Sarah      15   F   W  "         "
Margaret   11   F   W            "
Bridget    10   F   W            "
Rose        9   F   W            "
Elizabeth   6   F   W            "
Thomas      4   M   W            "
James CUNNINGHAM Self M Male W 55 IRELAND Contractor IRE. IRE. Sarah CUNNINGHAM Wife M Female W 56 IRELAND Keeping House IRE. IRE. Sarah C. CUNNINGHAM Dau S Female W 25 NJ At Home IRE. IRE. Margaret H. CUNNINGHAM Dau S Female W 23 IA Dress Maker IRE. IRE. Bridget A. CUNNINGHAM Dau S Female W 21 IA Laundry Help IRE. IRE. Rose M. CUNNINGHAM Dau S Female W 19 IA Student IRE. IRE. Elizabeth G. CUNNINGHAM Dau S Female W 16 IA Learning Dress Mak. IRE. IRE. Thomas S. CUNNINGHAM Son S Male W 14 IA At School IRE. IRE. Jeremiah CUNNINGHAM Self M Male W 30 IA Engineer R. R. IRELAND IRE. P. CUNNINGHAM Self M Male W 24 IA Teamster IRELAND IRE. M. CUNNINGHAM Wife M Female W 21 IA Keeping House IRELAND IRE.